The Nokia Lumia 1320 has finally landed on our shores for a retail price of RM1,199 but if you wish to get it with a telco, DiGi is now offering the device with a contract-free bundle and a slightly subsidized price. 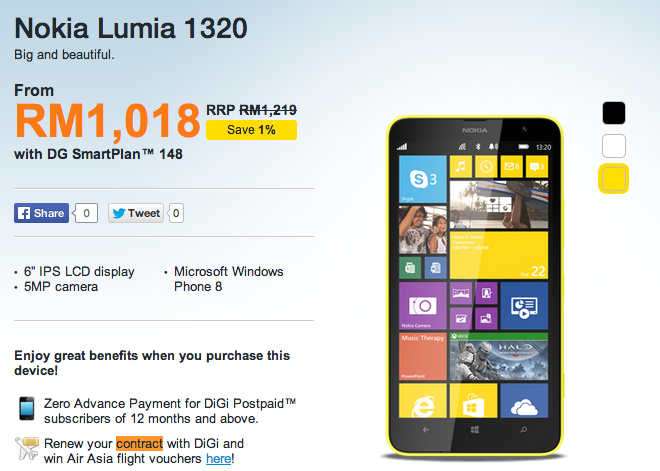 All you need to do is sign up for a DG SmartPlan postpaid plan – SmartPlan 58/88/148, and you can purchase the black, white or yellow Nokia Lumia 1320 for only RM1,018. Do note that “zero contract” still comes with advance payment (waived for DiGi postpaid subscribers of 12 months and above), which will be credited back to you so if you terminate your line before that, the advance payment will be forfeited. Visit DiGi for more information or to buy it from their Store Online now. If you do not wish to get it from DiGi or do not have a DiGi line, you can also purchase it from our very own Storekini.com for RM1,199. Check out our hand’s on post to find out more about the Nokia Lumia 1320.